Planning for taxes is a priority for all of us. But instead of planning for taxes, it’s ideal to have a financial plan which can be aligned with the tax planning. 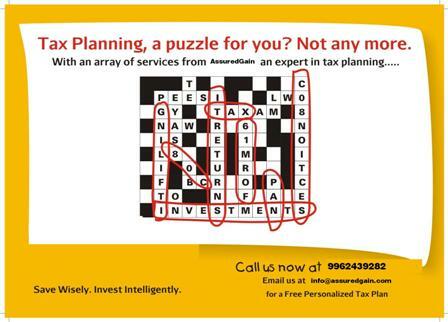 Remember, our life cover and investments should not be determined only by tax planning. AssuredGain expert will guide you for the right tax planning strategy. How does it feel when your hard earned money is paid to the government as income tax each month ? If it feels bad, maybe you need to be aware of how much income tax can be saved by you in a financial year. If the money was used for the overall development of the country, which is what it was meant for in the first place, then it would have been great. But in our country, the tax we pay does land up in the wrong hands and gets wasted. Well you can do nothing about that. You cannot also do anything about the money you pay in income tax to the government apart from saving some of it. Beyond a certain amount that everyone can save, you will end up paying tax ! The government does not levy tax for some of the money that you earn. That for general tax payers and female working women is Rs 2 lakhs for this year ( AY 2013-2014 which is same as FY 2012-2013). For senior citizens, that is Rs 2.5 lakh and for very senior citizens, it is Rs 5 lakh. Beyond this earnings of yours, you will have to pay tax. The government also says that the more you earn, the more income tax you have to pay. As you must be aware, and this is common knowledge, that tax is paid at 10%, 20% and 30% on pre-defined income tax slabs that your income falls in. Look at the general tax payers state for this year. What you can infer from the below table is that for Rs 2 lakh, he does not have to pay tax while for earnings between Rs 2 – Rs 5 lakh, he needs to pay 10% of that amount as tax. For earnings between Rs 5 lakh – Rs 10 lakh, the tax is to be paid at 20% and anything beyond that, it will be 30%. There is a cess of 3% also that is charged on the above, so actually the tax rate comes to 10.30%, 20.60% and 30.90%. All tax payers will necessarily fall in these three brackets. So the question we are deliberating on today is how much of income tax can you save ? While on one hand the government taketh away, on another it gives, albeit a small amount. It has made available different Sections of the Income Tax Act under which you can save this amount that you pay to the government, the most famous of which is the 80C deductions. Under Section 80C, you can invest Rs 1 lakh in various instruments. Under Section 80D, you can save Rs 35,000 towards health insurance premiums for yourself and your family. Use the simple logic above which shows that you would have paid 10.30%, 20.60% and 30.90% of tax – the same percentage of Rs 1.55 lakh you will stand to save. It is important to note that these savings are valid for every tax payer who saves his money into the sections mentioned above. Over and above this, other sections of the income tax are applicable to you depending on which one is valid for you – for example – if you have a home loan, then the interest component can be used to save income tax. Similarly, there are other sections that can be used. Please do feel free to contact us for free tax planning review. Please use the below form to contact us or call 09962439282, we will be happy to work with you in tax planning.